How do I type š on an international keyboard? I'm currently writing emails frequently to a Slovenian who has the letter š in his name. I use copy and paste for the letter š, which is quite inconvenient. I'm using the US keyboard layout. How can I type this letter directly from the keyboard? You must have U.S. Extended keyboard layout enabled for the above to work. You can choose edit menu (in most software) then choose Special Character .. then go to Accented Latin tab and find your character Š. Simply hold down the S key and you'll be presented with three options - press 3 on your keyboard to type š. If you need a capital Š just use the Shift Key or Caps Lock. If you have the patience to configure the keybindings, you can try Ukelele and create a keyboard layout for your needs. Not the answer you're looking for? Browse other questions tagged keyboard internationalization . 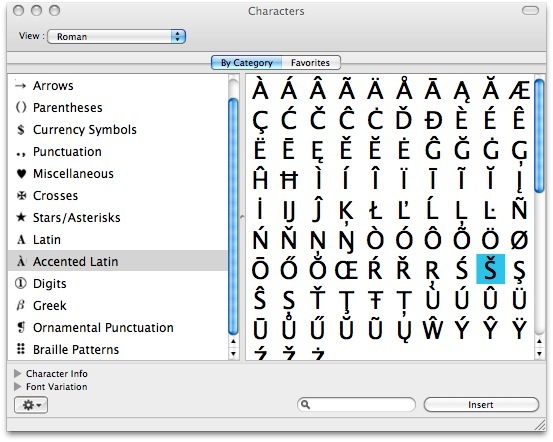 US International (AltGr dead keys) layout on Mac OS X? How Do I Type with IPA (International Phonetic Alphabet)? iPad - type pinyin-ized Chinese with diacritics?